Tired of being told that winning is everything? That failure is not an option and that it’s bad to be a loser? Then this is the show for you. Not only will we teach you how to cope with loss. We’ll show you how to revel in it! 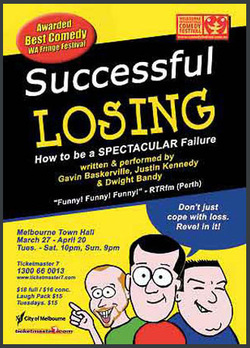 In a series of sketches, discussions, stand-up and general silliness SUCCESSFUL LOSING will delve into all aspects of loss, from losing pens to losing your job and will demonstrate how failing in all aspects of your life is an accomplishment in itself and something to be proud of. Successful Losing, as the astute may be able to figure out, is a loose collection of sketches simultaneously celebrating and mocking life's failures. It's generally better than you might expect from the premise. Mostly that's down to the upbeat performances, especially from Justin Kennedy, the most naturally funny of the trio. But the sharp banter between all three provides a strong backbone to the comedy. Their lively performances and on-stage chemistry gets them over some rough patches - a familiar parody of theatre in education groups or a couple of all-too-simple reversal-of-logic sketches - and raises the better-written elements even higher. The formal skits may not live up to the enjoyment of the less rigid out-of-character interaction, but this is ultimately an hour of good, undemanding fun.